Milan design week 2018 may be over, but it's not too late to see which exhibitions were most successful. Using our #milanogram2018 hashtag, we've picked out the 10 that proved most popular with Instagram users. Over 7,000 photographs were tagged with the #milanogram2018 hashtag on Instagram during the biggest design event of the year, which took place from 17 to 22 April. They include shots of the mirrors at COS's installation, American-themed pop-up restaurant The Diner and disco-inspired furniture from Gufram. 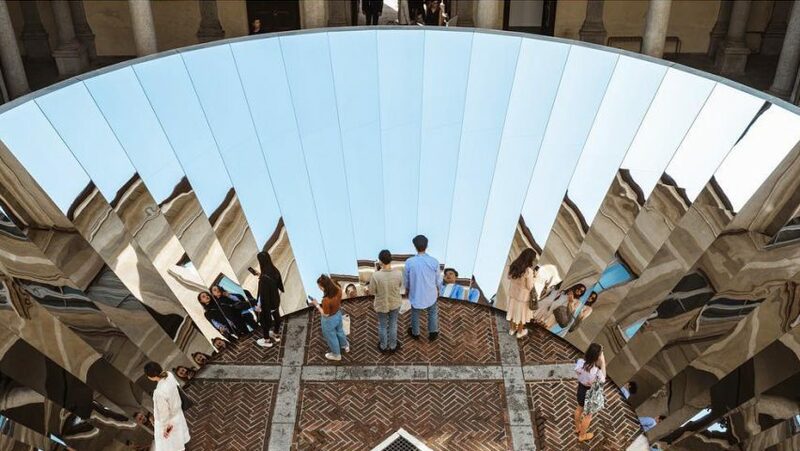 The most Instagrammed installation of Milan design week was Phillip K Smith III's faceted mirrored structure for fashion brand COS. Made from angled mirror panels on a concrete base, the structure filled the courtyard of a 16-century palazzo. The OMA-designed Fondazione Prada was one of the most visited spots in Milan last week, as it unveiled a new nine-storey tower filled with Instagram-friendly art and design. Highlights includes the Upside-Down Mushroom Room by Belgian artist Carsten Höller, which featured giant red and white rotating mushrooms sprouting from the ceiling. The big highlight at the Ventura Centrale venue was Rockwell Group's American-themed pop-up restaurant, in a vault underneath railway tracks. Images of The Diner's neon lighting, spelling out the food on offer, were splashed all over Instagram. 2 x 4 used a custom typeface to create this lighting, specially designed for The Diner, called American Optimism. British architect Asif Khan, who recently completed the impressive Vantablack pavilion for the 2018 Winter Olympics in South Korea, was behind this red wooden structure in Milan's Palazzo Litta. Named Tempietto nel Bosco, which means Temple in the Forest, the pavilion's intricate design and red colour made it an Instagram hit. New York studio Snarkitecture teamed up with quartz manufacturer Caesarstone to create this installation exploring the changing forms of water. Located in an abandoned 19th-century building, the installation presented materials in the forms of river, glacier, ice, liquid and steam. One of the surprise hits from Milan design week took place inside a hotel. The ME Milan Il Duca hotel showcased a range of objects from the personal collection of Milan gallerist Rossana Orlandi, including unpublished pieces by Fernando Mastrangelo, Nacho Carbonell, Studio UUfie, Damiano Spelta, German Ermics and Von Pelt Atelier. The exhibition remains open until 30 April 2018 at Piazza della Repubblica 13. Milan's Palazzo Clerici provided a dramatic backdrop for an exhibition by Danish design brand Hay, co-working and office company WeWork, and sound specialist Sonos. The contemporary furniture, paired against the historic building's ornate interiors, was very popular with Instagrammers. Ma Yansong's studio MAD created an interactive installation, featuring an illuminated ring suspended above the Seminario Arcivescovile. Named Fifth Ring, the installation was particularly photogenic due to the stream streaming off a central pool. Designers including Patricia Urquiola, Marcel Wanders and Fernando Campana joined forces to present Louis Vuitton's Objets Nomades homeware collection at Milan design week. A ceiling covered in thousands of red and pink Atelier Oï origami flowers was the most photographed part of the exhibition. Discotheque-inspired carpets and furniture featured in Gufram's Milan design week showcase. Called Disco Gufram, the collection included 1970s "disco seats", cabinets containing warped disco balls and carpets that mimic dance floors.